Knowing who you need to talk to, gain agreement with or keep updated is central to implementing successful measures. Many management information projects fail because of political or communications problems. This makes it especially important that you clearly identify, document and manage your stakeholders. The first step is to identify who your stakeholders are. Data originators - The people at, or very close to, the point at which the data is collected or generated. This might be an agent or team manager in a call centre, for example. Data aggregators - People involved in pulling the data together, but probably not analysing it. Sometimes they will be the ‘data packagers’ as well. Often these people are part of the company IT function. Data packagers - The ‘packagers’ will perform analyses, create reports and dashboards. These people often work in a management information, business intelligence or reporting team. Internal customers - The people who use the output from the packagers to make decisions that affect the business. Stakeholders are people who are involved in some way with what it is you’re trying to do. 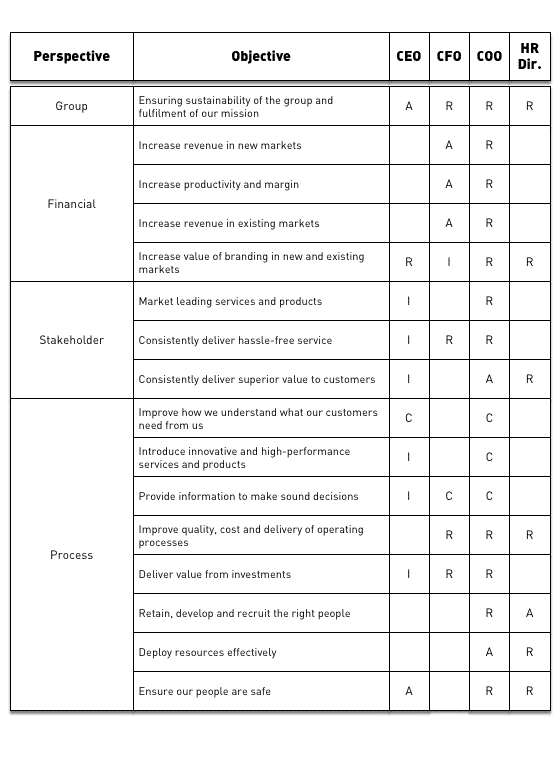 To identify the key stakeholders I use a simple (and commonly used) tool called a RACI assignment matrix. It can really help clarify how you need to engage and inform your wider audience and also gives you a document for review and approval. Responsible - These are the people who do the work to achieve the task objective. Accountable - This is the person who is ultimately answerable for correct completion of the task. This person will sign it off. Consulted - These are people whose opinions are sought. They are often subject matter experts. It is a two-way dialogue. Informed - People who need to be kept up to date on progress. This is not normally a two-way conversation. The idea is to create a simple matrix. Along the top you have column headings corresponding to roles within the business - the ‘Name’ columns. Down the side you have either a specific KPI or report or a strategic objective or business outcome. It will depend on the precise nature of your project and the number of measures/reports involved. On a big project it just is not practical to go down to individual measures so you need to group things in a logical way at a higher level. You then go down the list systematically and ask yourself the question ‘Is this person responsible for, accountable for, consulted about or informed about this particular KPI/objective/ business outcome? One of my clients pointed out RACI isn’t in hierarchical order. In fact it should be ARCI, but this is probably best avoided! So, to summarise, the RACI matrix gives you a neat way of grouping stakeholders by the method with which you will interact with them. It can be really useful for creating communication plans since you can refer to a complete block of stakeholders as, for example, ‘informed’ and reference it back to your RACI matrix. You can further refine the matrix by grouping the names into data originators, data aggregators etc. You can download a RACI template here. The next step is to make contact with those stakeholders.